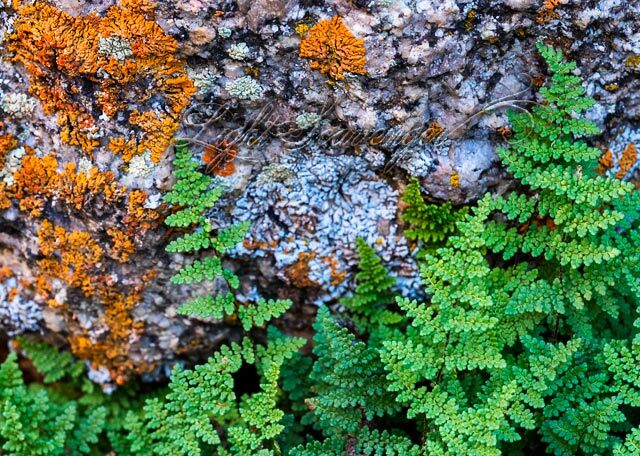 I love both lichens and ferns, really love them, and was thrilled to see them side-by-side in the Sandia foothills earlier this month. Both always seem to grow on the north side of rocks in the foothills, in the shade, and that makes it fairly difficult to get a good photo of them together. On this particular day, however, I was using a rented lens — much better than the equipment I usually use — and managed to get a few decent shots.